2 Where is Rotterdam and how to get around? 3 Where to stay in Rotterdam – Netherlands? Spending 5 weeks in the Netherlands with my daughter Rosie, gives me the opportunity to explore my birth country quite a bit. I’m a HUGE fan of Amsterdam but last time I was there, 2 years ago, I was overwhelmed by the amount of people and I didn’t like it that much anymore. This time I’ve more or less decided to NOT visit Amsterdam but to visit many other great places of interest that the Netherlands has to offer and some of them are an easy day trip from Amsterdam. Like we can’t wait to find out about all the best things to do in Rotterdam with kids, together with our dear friend Willem. Other things on our wish list are: Biesbosch, Leeuwarden, Muiderberg, Maastricht, Brussels in Belgium and Aachen in Germany. 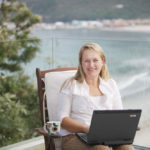 I’m not sure if we get to ALL these but we are well on our way while I’m writing this. 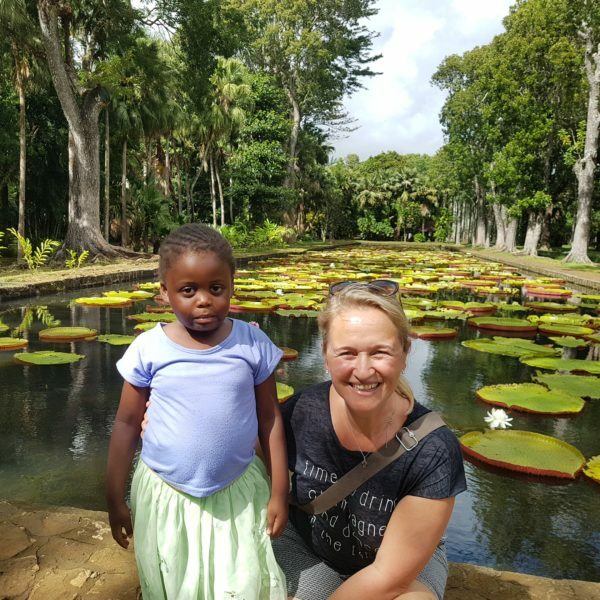 If you would like to read about our city visits, READ HERE about our 3 day trip to PARIS and HERE about 48 hours in Cape Town. Willem recently moved from Amsterdam to Rotterdam so logically I planned to visit this city and to experience all the great things to do in Rotterdam. By the way, please check out Willem on www.misterlocal.nl, he still offers walking tours of Amsterdam sometimes. He has created a great Voicemap Guided Tour which you can download on your phone. Voicemap is an awesome app in any case so check it out. 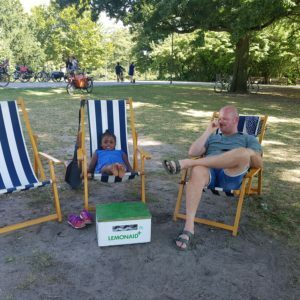 My daughter is a good explorer too so I decided to NOT leave her with her grandparents and to take her with so we can experience the top things to do in Rotterdam with kids. 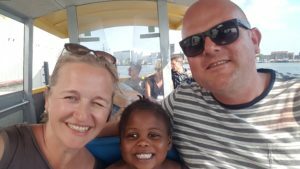 It will be another great solo parent adventure travelling as a single parent but this time we have our fantastic friend Willem who guides us around. I love exploring with a friend who lives in Rotterdam so we get to see not just the touristy things. 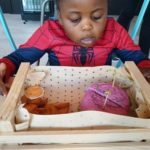 We both, actually all 3 of us my 5 year old daughter included, love great food which is always an important theme of all our solo parent adventures. 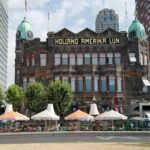 I know we will have a fantastic 2 days in Rotterdam so carry on reading if you’re planning a weekend in Rotterdam or if you’re looking for a Rotterdam one day itinerary. This article will give you plenty of ideas of what to do in Rotterdam in one day. We will also look at day trips from Rotterdam because there’s a lot to do in the area of Rotterdam. Are you staying in Amsterdam and want to do a full day tour of The Hague and Rotterdam? BOOK IT HERE! Explore more! Where is Rotterdam and how to get around? Rotterdam is situated in the province Zuid-Holland. 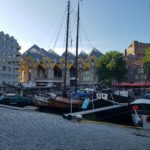 A day trip from Amsterdam is easy and quick as it only takes 40 minutes by train to get from Amsterdam to Rotterdam so I hope more visitors will be taking this trip. You can easily visit Rotterdam in one day although I’m quite sure once you’re there, you want to extend your stay or come back to explore all the places you didn’t get a chance to see. Rotterdam is also very close to The Hague which is another great city with highlights like Panorama Mesdag, Madurodam, the beaches of Scheveningen and of course the Peace Palace. The train trip from Rotterdam to The Hague will only take you 30 minutes. The Netherlands is quite a small country so it is easy to include many more highlights than only Amsterdam. Rotterdam has a fantastic transport system. If you only have 1 day in Rotterdam and you have specific points of interest, the metro is a fast way to get around. Although if you base yourself centrally, you will be able to walk to most of the places. As all cities in The Netherlands, Rotterdam is extremely pedestrian friendly and we encourage you to visit Rotterdam and WALK. While we visited it was very very hot so sometimes we just didn’t want to walk anymore. There’s not only the metro but also the tram, buses and you can also use bikes that are available to rent to cycle from A to B. We loved the waterbus which is also part of the public transport system. The water taxi which you can book 10 minutes before you need to leave is a great way to get around. I love cities with lots of water and to move around on a boat so this aspect of Rotterdam was super enjoyable especially with the hot weather we were experiencing. Where to stay in Rotterdam – Netherlands? While walking around and exploring the city, we came across quite a few Rotterdam Hotels that were either iconic, special, cute and / or historic. 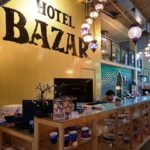 So besides all the big international chain hotels like Hilton and Marriott, you could book the BOAT HOTEL, a former cruise ship, the SS Rotterdam, have a bohemian experience at Hotel Bazar, rent a tiny home on the water, the Wikkelboat or stay in the historical grande Hotel New York. The most iconic and well known thing to do in Rotterdam is most probably the cube houses. Did you know that there’s a hotel inside them as well? It is the STAYOKAY Rotterdam which is a great choice too, especially if you’re travelling as a family. 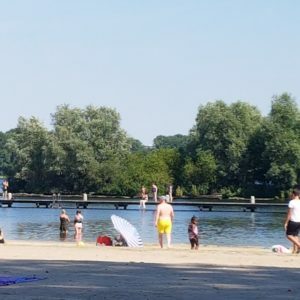 We stayed in STAYOKAY Dordrecht in the Biesbosch and we had a very good time and loved the place so I can definitely recommend this chain of family friendly hostels that you find throughout The Netherlands, often in unique locations. In case you’re looking for a complete overview on tours in Rotterdam, have a look HERE! When I ask Rosie what was one of the best things to do in Rotterdam, she will reply: SWIMMING!! 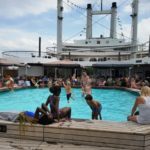 And swimming at the SS Rotterdam is a joy for both kids and parents because the parents can sit by the swimming pool and enjoy some drinks and snacks (couldn’t resist the ‘bitterballen’ of course). You can take a great tour of this incredible ship that would bring people to the New World in the old days. A former employee will guide your around and share many stories with you. The Netherlands is experiencing the driest and hottest Summers of all times so after walking for quite a bit, we just wanted to sit down and relax. We enjoyed sitting by the pool and it was my first portion of Bitterballen to taste while being in The Netherlands. Lucky us that the little souvenir shop on board still had one swimming shorts in Rosie’s size so that she could splash around. Of course by the end of it all, she didn’t want to come out of the pool. We had a lovely afternoon and I kept saying: oh, this is like Mauritius on the Maas! 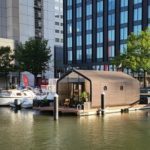 You can also stay the night at this beautiful ship which seems like a wonderful romantic thing to do when spending an entire weekend in Rotterdam. Would you like a private tour of the SS Rotterdam? Book it HERE! Situated in an old industrial building across from the iconic Hotel New York, we enjoyed the loveliest lunch here in a super relaxed atmosphere. It is SO nice if you can explore a city and not only hit the tourist attractions. 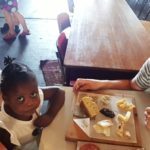 We shared a charcuterie platter and a fabulous cheese platter accompanied by organic delicious apple juice and oy you can find the BEST bread in this country so we are totally indulging in all the fabulous breads. A fun thing to do at Fenix Food Factory is to buy a platter and 10 coupons for all the different food stalls so you can get something delicious from many different places. 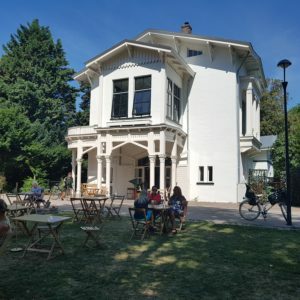 Certainly one of the great things to do in Rotterdam, even if you only have 1 day in Rotterdam, make sure to include a lunch at here. At the fresh fruit and veg shop, we bought fresh watermelon for dessert which is really the best thing to eat when you’re exploring a city in this heat. How about a 2 hour Private Food Tasting Tour in Rotterdam? Book it HERE! 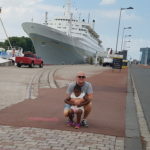 It might seem weird to recommend this Witte de With Street as a great thing to do in Rotterdam with kids but you know what, I always look out for activities where both Rosie and me can have a wonderful time and can share the experience. 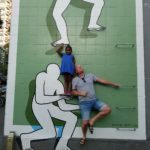 And yes, often I will have to find a playground for her so she can get rid of some energy, however, a great restaurant experience, a small ice cream for dessert and then topping it off admiring the interactive street art, is a perfect way to explore an early hot Summer evening in Rotterdam with kids. Willem knows that I really love Indonesian/Suriname food and Rotterdam has some fantastic restaurants on offer. He brought us to Warung Mini which was packed to the rafters and it was difficult to find a seat. While Willem was ordering some roti, Soto Ajam and Sateh, Rosie and I found some space next to a nice couple and we started chatting immediately. What I loved most about Rotterdam was the incredible mix of cultures and colours. While having dinner at Warung Mini, I don’t think 2 patrons came from the same country or background. We were surrounded by many languages, cultures, colours and countries. I ABSOLUTELY loved it and felt at home. This is how the world is supposed to be. Love and peace and sharing good food! Rosie happily chatted away to everyone and enjoyed eating the chicken potato roti and sateh. My Soto Ajam was fantastic. After dinner we had to have a little ice cream. It had been another hot day so a stop at De Ijssalon was necessary. Our next stop was the street art and we played around a bit taking pictures. When you walk around in Rotterdam for one day you will find a lot of street art and famous quotes from famous ‘Rotterdammers’ like Jules Deelder. Rotterdam was completely bombed in WW II. Only a few old buildings survived so it is not necessarily a very beautiful city. Showing art, poetry and quotes on otherwise ugly buildings gives the city character and it lifts your spirits while you explore too. BOOK HERE a private cultural walking tour of Rotterdam! 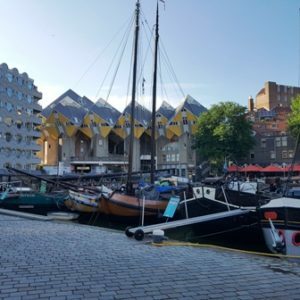 Even if you’re only 1 day in Rotterdam, a visit to one of the largest harbours in the world should be part of your Rotterdam day trip. During this 75 minute harbour cruise you will get a good insight in the operations and the history of the harbour. The tour is conducted in English, Dutch, French and German so hopefully there’s a language for you. If people ask me what to do in Rotterdam in one day, I would strongly recommend to take the Spido Harbour cruise. We enjoyed ourselves watching the impressive skyline of Rotterdam, seeing the Erasmus bridge we just walked and passing the many thousands of containers. On the way back Rosie recognised the SS Rotterdam where she had swam the day before. Rosie might have been a bit small to learn anything in particular from this tour but for teenagers this for sure will be an interesting Rotterdam point of interest. Perfect combo tour: Private walking tour including Harbour cruise on the Spido! Book it HERE! Perfect full day small group tour from Amsterdam to visit Rotterdam and go on the SPIDO & explore Delft & The Hague in the afternoon. Book it HERE! One of the greatest things to do in Rotterdam with kids, especially with small kids is visiting the kids marina behind the Maritime Museum. 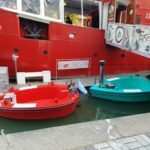 Kids can choose a little tug boat and the be captain of it for 15 minutes. It is great to see that kids can be in charge. One adult should join the 15 minute experience. Now that Rosie has experienced this, she wants to have her own car too… Not sure about that one. Book your visit to the Maritime Museum HERE and make sure to go to the Kids Marina behind the museum! It was fantastic for visit the Markthal Rotterdam again and now together with Rosie. 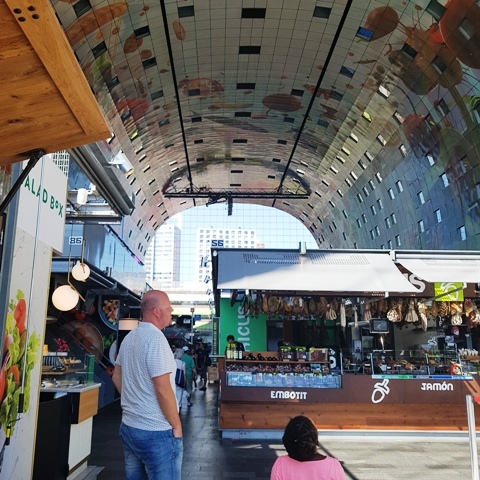 Since we both love nice food the Markthal is like a dream come true because you will find all your favourites under one roof. The building itself is an eye catcher and absolutely beautiful. It is a mix of apartments, retail, entertainment AND 3 floors of parking. It is located at the historical Binnenrotte next to Blaak Train Station. It is great thing to do in Rotterdam with kids because everyone can choose something to eat of their liking. There’s also enough space to walk and sit. The toilets are good. In case you just want to shop for your own meal, there are lots of deli shops as well and downstairs is a big Albert Heyn for all your groceries. Interested in Markthal and other architecture highlights in Rotterdam? Book a private walking tour HERE! This is the most famous and visible icon in Rotterdam that is an essential part of the skyline which you can see from almost anywhere in Rotterdam. The 185 m high tower is the highest watchtower in The Netherlands. While you ascend in the elevator listen to the stories about Rotterdam and take breathtaking pictures of this unique view of Rotterdam. One of the great things to do in Rotterdam with kids is take part in the space tour adventure. On Sunday the Deli downstairs even boasts a kids club where kids can build their own Euromast out of Lego. While the parents enjoy the best coffee in Rotterdam, the kids are kept busy. However, we did something completely different. It was very hot on the day that we were walking towards the Euromast and Willem knew this great place to have lunch close to the Euromast in The Park. So we just sat down, chilled and blissed out at De Parquit. See how pretty this place is? Walking the city in the heat made us want to cool off a bit and chill somewhere on a beach. 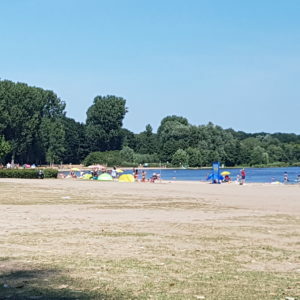 Rotterdam is not by the sea however only a few metro stops away from the city centre and you will be able to go to the Kralingse Plas which is a great resort style area where kids can swim and play. You an bring a picnic and we even saw people enjoying a little BBQ in one of those small portable BBQ sets. It was lovely to hang out for the afternoon and give Rosie a chance to swim, something she loves so much. Now with so many fantastic and fun things to do in Rotterdam, did we convince you to visit whenever you’re next in The Netherlands or Amsterdam? 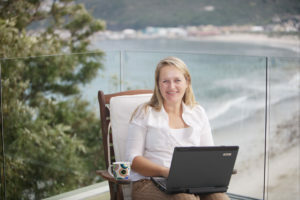 This entry was posted in Blog, Destinations, Netherlands. Bookmark the permalink.